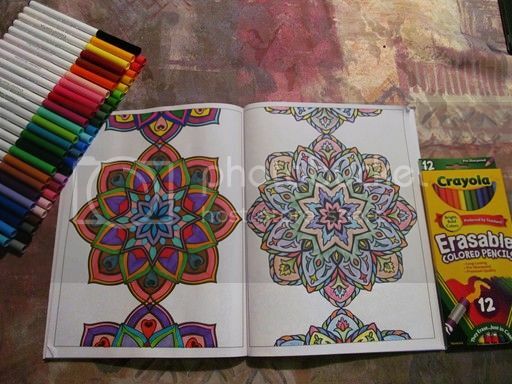 When I reviewed the Barcelona Adult Coloring Book for Library Thing's Early Reviewers Program back in February I was at first skeptical about the reported calming, serene effects of this new trend. It didn't take more than five minutes to experience the meditative qualities firsthand, and so I became a coloring book convert. I don't know why it works, but everything they say about adult coloring books really happened to me as I worked on my pages. My first experience was so positive that when Alexandru Ciobanu, the photographer and author of the book, offered me a paper review copy of another of his works, I said yes. I was curious if working from an actual book would make any difference, and I wanted to try some other types of markers and pencils to test how well they worked as coloring media. 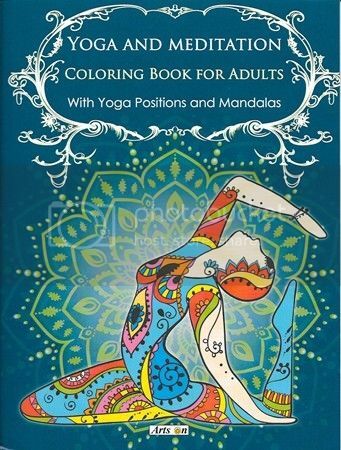 Yoga and Meditation Coloring Book for Adults arrived a short time later. 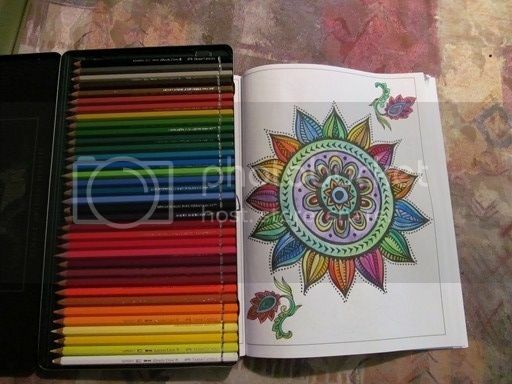 It's a slim, large book with fifty different illustrations to color, which range from large, easy-to-do mandalas to very intricate, highly-embellished body forms in mind-bending yoga positions. The illustrations definitely have an east Asian feel to them, but they also celebrate the female form without being crass or vulgar. I smiled when I saw some illustrations depicting a pregnant woman; that was a nice surprise. Since there were no guide pages in this book to inform my color choices I drew on the cover art as inspiration. I liked the rainbow effect of the multi-colored body embellishments, and it freed me to do pretty much whatever I wanted. As with the Barcelona book I began by using watercolor pencils, which are the easiest for me to handle. The only difference this time was that I used a bit less water on my brush while dampening the penciling, mainly to keep from saturating the page. I also placed a paper towel under the page to keep the watercolor from soaking through to the next page. I was surprised at how little bleed-through there was to the back side of the page when I was finished. The pages of the book are pretty lightweight, but they hold up well. For my second page I tried my artist-quality colored pencils. Because I can't use a lot of pressure due to the arthritis in my hands, I was expecting the same, poor results I had with the Barcelona book. I soon discovered that my penciling looked much brighter this time, which I have to attribute to the quality of the paper in the book. I tested my fine-line Sharpie markers on the pages (and if you want to test any media in a coloring book, the best place is the title page or the back/end page), but they did bleed through quite a bit. As an alternative I bought some washable markers and erasable colored pencils, both made by Crayola, and used them to do two pages for a side-by-side comparison. The markers came out very vivid, and the tips allowed me to use both broad and fine strokes when I needed to. The colored pencils produced a lighter, more artsy result, but I liked the convenience of being able to erase any mistakes I made. I liked all the results this time around; I think the washable markers performed best, and with 50 colors more shades to choose from you can get a lot of shading and contrast. The watercolor penciling turned out almost as well, and gave me the opportunity to do a bit more in the way of shading and blending. The colored penciling might not have been as strong, but the paper used in the book seemed to help me get more color onto the page with them. Working from a book also didn't make a lot of difference, as this one is very flexible and lays pretty flat while you're using it. With every page I worked on in the Yoga and Meditation coloring book I felt almost instantly calm, focused, and clear-headed. I can't explain that any more than I could with the Barcelona book. It was a very relaxing experience, and now that I have an entire book to work on I will be revisiting it every time I need to wind down and find some serenity. Since I'm a high-strung person whose thoughts are perpetually crowded, this is simply wonderful for me. 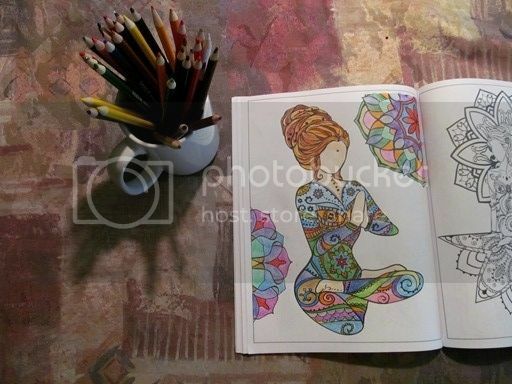 I highly recommend Alexandru Ciobanu's Yoga and Meditation Coloring Book for Adults. When I was in PT school, I had a copy of The Anatomy Coloring Book. I loved it. It provided me a much needed kinesthetic break from all the reading and studying I had to do, while still reinforcing the work I needed to be doing. I haven't colored since - this was in the mid 1980's, so maybe I'm past due. This seems like just the kind of gift to give myself. I am so glad you tried the washable markers! I have been wondering how they would do and I'm glad you said they worked out well. I almost bought the Sharpie markers, but having used Sharpie's in the past at work, I knew they would bleed through to the back of the page. I haven't tried watercolor pencils yet, so that is an avenue for me to explore. Tonight I will be heading off to my local store to pick up those washable markers I didn't buy last week!